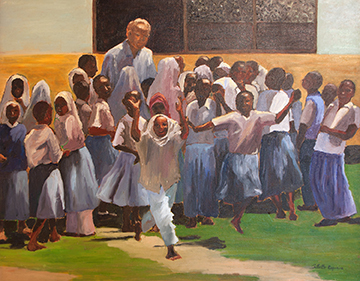 My paintings in this exhibit, titled Into Africa, are based on my experiences as I accompanied my husband on four service-related trips to Kenya and South Africa. In these journeys, I was struck not only by the power and beauty of nature throughout the continent, but also by the resilient joy and sense of community among its people, who have suffered some of the greatest hardships. I witnessed this buoyant spirit even in the slums of Cape Town, where thousands of families had been dispossessed and displaced during the period of apartheid, and in Kenya, where a tragic number of children have been orphaned by post-election violence and HIV . My oil and acrylic paintings show the determined efforts of women in tasks ranging from hauling heavy bundles of logs, to cooking over make-shift grills in shanty towns. In my paintings of children, I hope to convey the energy and free spirit of youngsters engaged in simple pleasures together. 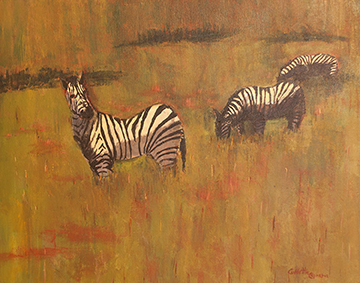 My paintings of the animals of Africa feature not only the unique qualities of these beautiful and powerful creatures but also the inspiring relationships that exist within species— including zebras who band together as a camouflage defense technique, cheetahs who form "coalitions" of mutual support, and the maternal bonds between mothers and their offspring. I have enjoyed drawing and painting since my childhood days. In the years in which I earned my Bachelor's degree in English and Philosophy and Master's in Philosophy, I found the creation of art to be a wonderful vehicle to express my ongoing discoveries regarding the nature, meaning, and value of life. 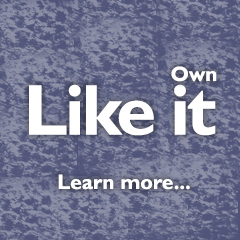 of Fredericksburg since 1993 when I moved here with my husband and son. 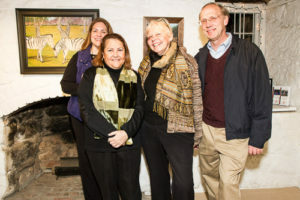 I have been a member of the Brush Strokes Gallery for seven years and currently serve on the Fredericksburg Arts Commission. In addition to my work as an editor and writer for a DC-based think tank, I enjoy writing regularly for the Free Lance-Starand Front Porch magazine. 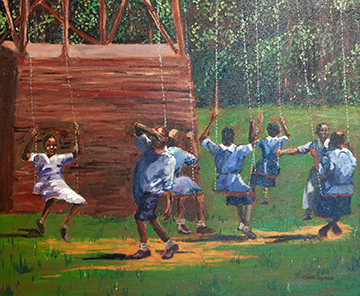 A portion of all proceeds from this exhibit will be donated to a Fredericksburg-based organization, E-3 Kids, which was created to sponsor a school for children in Kenya.